Going to the dentist isn’t as painful as it used to be. Today’s advanced dentistry makes even the most invasive procedures — including root canals and extractions — relatively painless and quick. Yet many people still get nervous when it’s time for their dentist’s appointment. Even though they may understand rationally that there is nothing to fear, there are still a lot of patients who would rather be anywhere else than in the dentists’ chair. One of the best ways to deal with anxiety stemming from visiting the dentist is to distract yourself with something more pleasant. 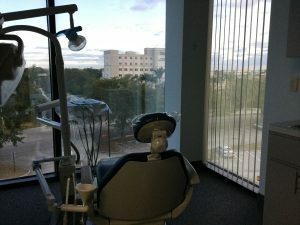 Tamarac Dentist — That’s Entertainment! Many of today’s dentist’s office offer in-room entertainment to distract the patient through entertainment. This can include high-definition televisions broadcasting their favorite daytime programming. Or it could be earphones that can be conveniently slipped on so the patient can listen to classical, jazz, or their favorite jams. Listening to music is a particularly effective way to drown out the anxiety-producing sounds that can come with visiting the dentist, including the whirr of the dentist’s drill. Getting into your favorite music is naturally relaxing and it can put you at ease while your dentist is working on your teeth. But you don’t always have to turn out outside media to relax your mind while visiting the dentist. Deep-breathing exercises can help lower anxiety levels. So can meditation. There are currently a number of guided meditation apps you can use to put your mind into a meditative state. One of the best is Headspace, which has a free 10-day trial you can use to begin training your mind for tranquility. Seeing the dentist isn’t as scary as it was in the past. But if you are still dealing with anxiety issues, sooth your mind and spirit by distracting yourself any way that puts your mind at ease.